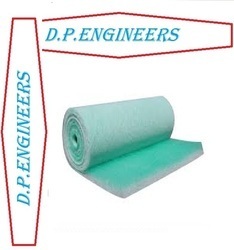 Manufacturer, Supplier and Exporter of Filter Bag, Non-Woven Filter Bag, Pulse Jet Filter Bag, Polyester Filter Bag, Filter Bags, Fiber Glass Filter Bag, Reverse Jet Filter Bag, Shaker Filter Bag, Anti-static Filter Bag, Acrylic Filter Bag, Felt Filter Bag, Absolute Bags, Bag Filter, India. This Filter bag is made from high quality raw material and includes international quality standards and made from various applications. Our Filter bag is widely appreciated for its quality and durability. 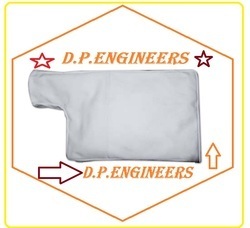 This Filter bag can be customized as per client requirement. Application: Pre filter for comfort air conditioning applications. 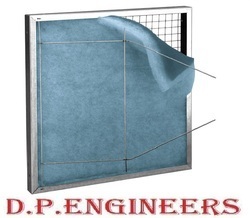 Type: Coarse dust panel filter. Gravimetric efficiency: 75% – 85%. Temperature: 120°C maximum in continuous service. Finish treatment: singed and glazed, heat set, WR / PTFE coating. Sewing thread adopted: PTFE filament sewing thread. Top ring: S.S material as required. Application: for asphalt mixer fume or dust removal. 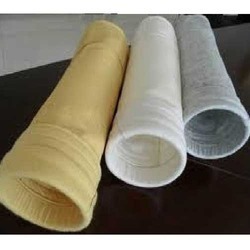 Manufacturer, supplier and exporter of Shaker Filter Bag. Filter bags are one of the most important part of a dust collector. 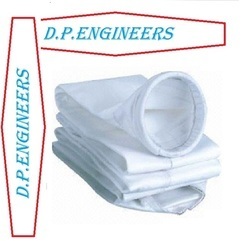 We manufacture filter bags like shaker type dust collector in a number of designs; DPENGINEERS gives Special consideration on fabric selection, fabrication technique and designs to give the best performance. 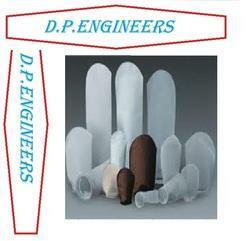 Our company is prominent in providing a wide range of Acrylic Filter Media to the valuable patrons. Our Acrylic Filter Bag is manufactured by making use of the optimum quality raw material. Normally in filtration acrylic refers to homo polymer acrylic which is essentially made from 100% of acrylic nitrite. Occasionally less expensive lower performance co polymer acrylics are used. 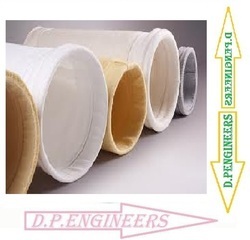 Manufacturer of Pulse Jet Filter bag. As far as The Pulse Jet Filter bag Concern it consists of filter cylinders(bags) enclosed in a metal housing. In operation, dust-laden air enters through the center of bag filter. Either pressure or suction delivers the dirty air to the hopper. The fine practices travel upward and collect on the filter bags. The clean air passes through the bag and is vented to the atmosphere. A high pressure jet of compressed air directed through the bag at timed intervals removes the dust, which is deposited in the hopper and is easily collected for disposal or recovered for use. Pulse Jet Filter bag : The dust-tight Pulse Jet Filter bag has three section: a plenum at the top, a collector housing in the center and a hopper at the bottom. A plenum houses the blow tubes and supports for the solenoid valves. Clean air or gas is discharged through the exhaust outlet in the plenum. The housing contains the filter bag assemblies. Below the housing is the hopper which contains the inlet. A diffuser in the hopper, adjacent to the inlet absorbs the impact of the high velocity dust particles and properly distributes the incoming air. Pressure drop, which measures collector performance, is indicated by a D. P. Gauge connected at one end to the filter bag section and to the clean air plenum at the other end. A Gujtex rotary airlock is recommended as a discharge valve to handle the collected dust. 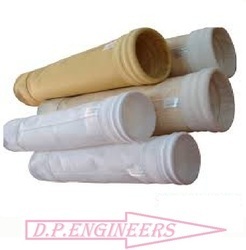 Supplier of a comprehensive assortment of Non Woven Filter Bags. 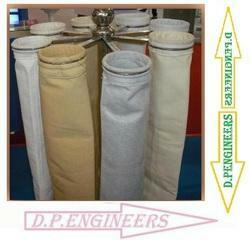 Non Woven Filter Bag are fabricated using superior quality fabric and advanced technology. The offered Non Woven Filter Bag are designed with high precision in order to meet the international quality standards. 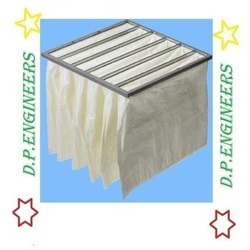 These Non Woven Filter Bag are Rigorously tested on various parameters by our quality controllers, Non Woven Filter Bag are available in varied patterns and sizes as per the varied demands of clients. 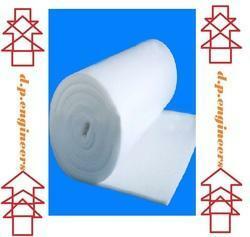 In addition to this, Non Woven Filter Bags can be availed by clients from us at the most reasonable price. 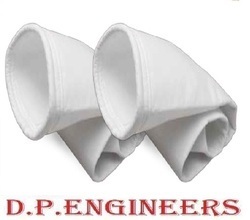 Non Woven Filter Bags are stitched according to customer’s requirement with state-of-the art stitching machines. Non Woven Filter Bags are used in a number of industries such as: cement, steel, incinerators, boilers, power stations, salt processing, ceramic, portable dust collectors, etc. 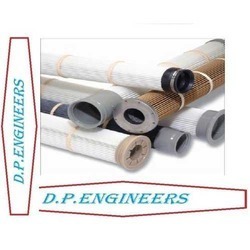 Outfitted with a modern infrastructure, we are the most prominent manufacturer, trader, exporter and supplier of a wide array of Pocket Filter.This filter is manufactured using optimum quality raw material and advanced technology. We provide this range to our clients in various specifications. 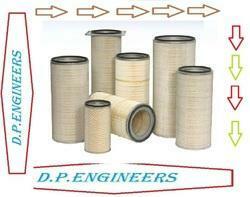 Clients can avail the offered filter from us at market leading prices. Type : Box & Flange. Frame : Metallic Sheets Rods With With Powder Coating. Media : Thermally Bonded Synthetic Filter Media. Efficiency : 50-99% Down To 20-3 Micron. Final Pr. Drop : 40 mm wc. Temp : 700 c. Max. All Standard Size: Customized Size. Fabric Selection Chart To Choose The Right Fabric Bag. We are the largest manufacturer and supplier of Leaf Filter that are highly efficient, reliable and durable. These Leaf Filters are used for filtration of dust particles and other impurities in various petrochemical and other liquid products manufacturing industries. It is completely automated as it consists of latest technology control system. All designs and measurements can be customized to your individual requirements and we can ensure the 100% reproducibility of any article. These filters are manufactured from 100% synthetic filter medium, consisting layers of needle felt and thermally bonded micro fibres. 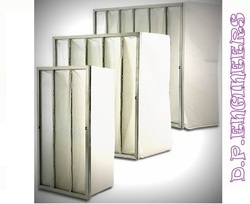 Each Filter consists number of individual dust collecting bags affixed to a corrosion resistantfilter frame. All media pockets are self supporting to give uniform airflow and total media utilization. 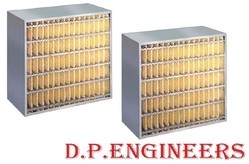 These fine filters find extensive applications in ventilation and high dust collecting areas. We offer a number of dust collector pleated standard filters that are available in three different diameters such as 150mm, 225mm and 325mm. These flanges are made from aluminium / stainless steel and its base and interior baskets are from 1.2mm galvanized steel. We are successfully ranked amongst the top manufacturers and suppliers of a qualitative range of Pleated Bag Filters. Fabricated using optimum quality factor inputs and sophisticated technology, they are designed in compliance with the international standards. These filters are widely praised among our valuable clients for their easy installation, leak proof nature and high durability. Apart from this, they are stringently tested on various parameters of quality in order to deliver flawless range at clients’ end. Application: Pre filtration in air conditioning or industrial processing systems. Media: Synthetic / glass fibre. Arrestance efficiency: 65% – 90%. Eurovent 4/5 efficiency: EU2 – EU4. Temperature: 80°C maximum in continuous service. These are ceiling filters for are used for spray booth. Our ceiling air filter are made of progressively structure media made using synthetic thermo bonded fibers – adhesive coated in depth. We also offer sizes which are customized as per specific customer requirements. 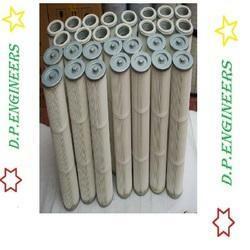 We are well known ceiling filter media exporter offering them at market leading prices.